A remodelled shell of a 1960s church building, which itself includes the crypt of an 1820s church hit by a V2 missile in 1945. Includes a café, two dramatic 8m high windows and a distinctive conical reflective space. RIBA Award Winner 2009. 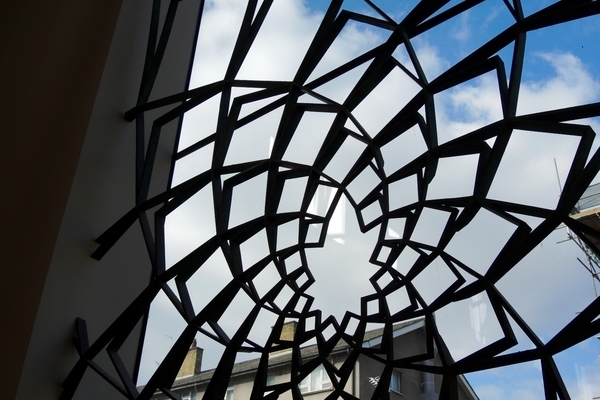 Lumen’s building is the work of several architects working in very different times. Our building's basement is the crypt of Sir William Tite’s 1827 church, built when Edward Irving was our minister. It cost about £1.6m in today’s money (£22,000 then). Its most striking, if incongruous, feature was a mini-version of York Minster’s twin towers. Its windows and finials had a thistle motif to denote its intended status as the ‘National Scotch Church’. We still use the 1827 communion table made to match Tite’s Gothic design. Some people associated with our church in its early years are buried in the crypt, such as the publisher James Nisbet (1785-1854) who paid 10 per cent of the building’s original cost. Tite’s church was so badly damaged by the V2 bombing of adjacent Church House in 1945 that it had to be demolished five years later. At other times, such a building might have been saved, but in a bankrupt country ruined by war, that was not possible, and our crypt, with its anonymous numbered graves, is all that remains of a Gothic extravaganza faced in Bath stone that was once a London landmark. The shell of our current building is the church built on top of the 1820s crypt in the 1960s by Courtenay Theobald during the time when Richard Whitehouse was our minister. Lord Reith laid its foundation stone in 1965 and it opened the following year. The distinctive concrete arches used for the roof trusses (and the cantilevered supports on top of the old crypt) probably owe their inspiration to Theobald’s many bridges: his 1966 Windsor bypass bridge was built at the same time as our church. We hope the design of the church helps us to build bridges and make connections. Theobald had to work with a very tight budget from the miserly government compensation payments for the loss of the original church – only £55,000 (less than £800,000 in today's money), so there were no funds for elaborate ornamentation of the kind that had gone into the 1827 building. 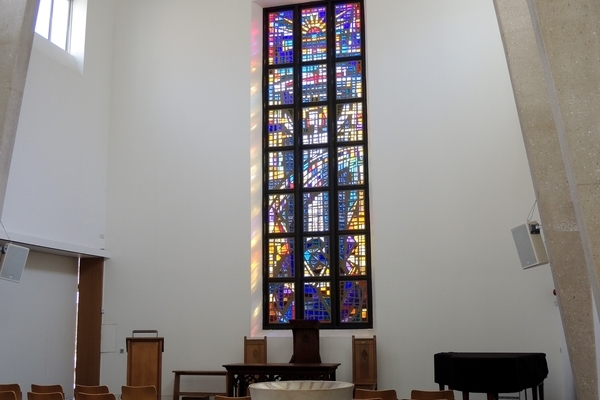 The main decorative feature of the new building was a 21-panel concreted glass window by Pierre Foumaintraux of the Whitefriars Glass Studio, which was originally positioned on the west side wall of the church. The 1960s building was completely remodelled in 2007/8 by Theis and Khan during the time when Maggie Hindley was our minister. 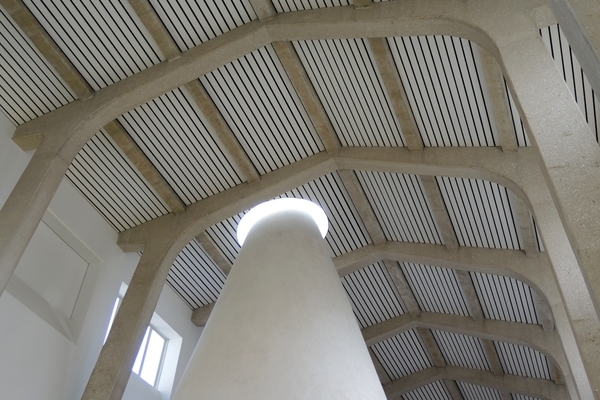 The redesign cost £2.5m and comprised three main elements: a cafe clearly visible from the street through a dramatic 8m high window; a new conical space for contemplation within the main body of the church and a new extension housing three community spaces. The conical space in the centre of the building reaches through the full 11m height of the building to a single roof-light, providing a secluded area for worship or small gatherings. The light inside alters with weather and seasons, which was intended to convey a sense of peace and separation from the bustle of the outside world. 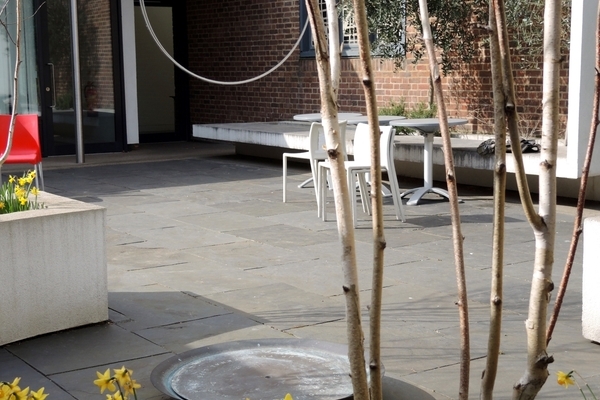 A garden at the south end of the building provides a modern form of cloister, with an arcade round a courtyard planted with herbs and silver birch trees. The redesign involved moving the 1966 Fourmaintraux window to the south gable wall to make it central to the church. The Theis and Khan redesign also involved commissioning new artwork. Alison Wilding designed a new font, drinking fountain and water fountain, and Rona Smith designed a sculptural screen for the north wall. 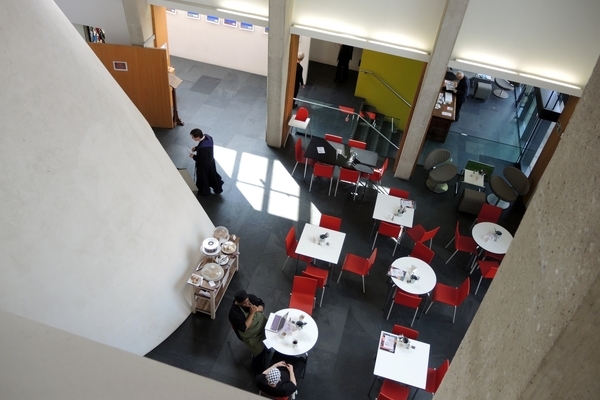 In 2009 our remodelled building received an RIBA award and our visitors’ book testifies to their number of people who find it inspiring and uplifting. 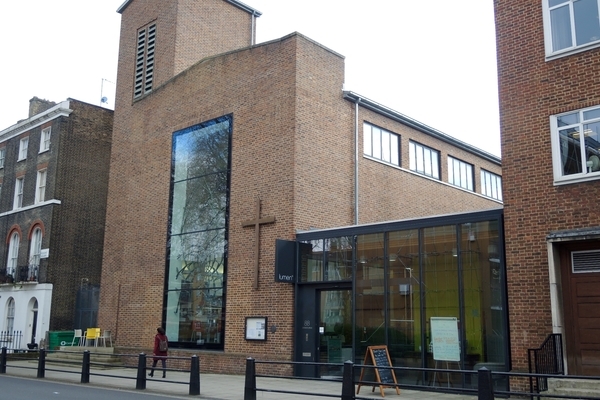 Lumen URC, formerly Regent Square URC, is in the heart of London's Bloomsbury. We worship in the reformed church tradition and belong to to the United Reformed Church, which brings together formerly separate Presbyterian, Congregational and Churches of Christ traditions.